With 2 small children in the house it’s difficult to not to have a brilliant Christmas as long as you spend December running (or hobbling in my case) about like a spinning top with lists and spending a fortune! All this is hard for MSers. Writing 40,000 cards and wrapping endless presents takes its toll on your hands and extra visiting, drinking and entertaining can play havoc with fatigue and mobility. Here are some of my funniest-fatigue related Christmas moments! The day before Christmas Eve The Husband was out “hunter gathering” in manic fashion, clutching yet another list at 9.30 at night. He figured supermarkets would be less crazy at this time and he’d be able to “nip” in and out. 90 minutes later he still hadn’t returned but I was happy on the sofa with a glass of wine and the remote. I tried to get up to go to the loo but my right leg had gone all rigid. Apparently it’s very difficult to sit up and get off the sofa when your leg won’t bend! Who knew! The next thing I knew I’d spun off the sofa and landed with a thump on my face! I’d slightly winded myself too and found out it’s also quite difficult to hoist yourself up onto all fours when your leg still won’t bend! Luckily my IPhone landed next to my face so I called The Husband who came home and rescued me! Christmas day was fairly successful in that I hadn’t fallen over, wet myself or fallen asleep anywhere! When it was time to go home I even (eventually) managed the mountain-esque stairs from my Mums front door to the car. At the top my legs gave way and I landed, with a thump, on the wet ground. The Husband tried, in vain, to hoist me up and into the car as a few too many glasses of sherry had taken its toll on him! Luckily my Brother-in-law is a fireman so we yelled 999 and he came to the rescue, expertly hoisting me up from the front and into the car. 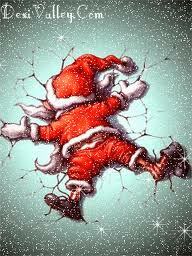 On Boxing Day I woke up feeling shattered! I slept on the sofa for half an hour despite the din going on around me. We went to my Brothers enormous Georgian house for supper and just getting from the car to his table took gargantuan effort! All went well though until I got stuck trying to go down the 2 stairs to his downstairs loo. My Mum rescued me going down and my brother rescued me coming back up so disaster was avoided. An hour later we discovered my toddler had drawn all over their new landing carpet with face paints so we beat a hasty retreat – well, they were hasty, I took about 15 minutes!